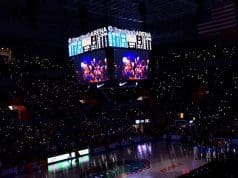 GatorCountry brings you a new podcast as we’re joined by Bud Elliott of SBNation to help preview Florida Gators vs. Florida State on Saturday. Andrew Spivey and Nick de la Torre ask Elliott his keys in the game and what the Florida Gators can do against FSU’s defense. 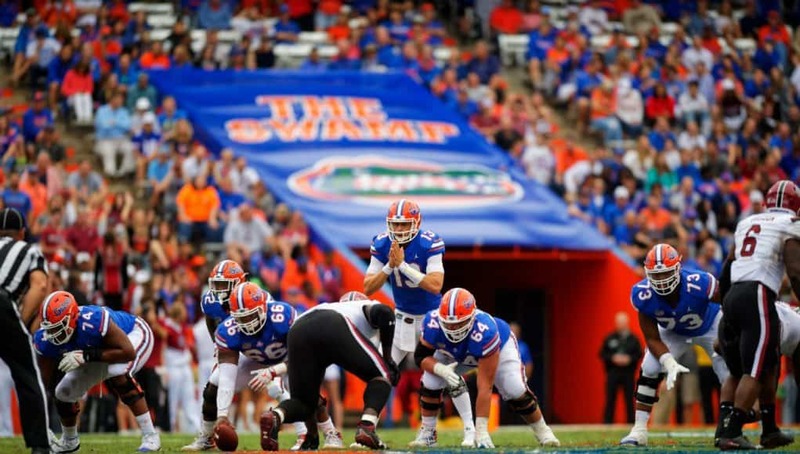 Andrew and Nick also breakdown the game and give you their keys for Florida and how they think Florida can attack FSU’s defense. Andrew: What’s up, Gator Country? Your man Andrew Spivey, here with Nicholas de la Torre. Nicholas, Wednesday, FSU week. Let’s get going. Nick: It’s rivalry week. All throughout the country fans are getting after it. Andrew: Nick, you’re like me. You’re a big baseball guy. You love baseball. I don’t know. I’ve never asked you this, baseball your favorite over football? Andrew: I’m saying if you had the choice, which would you choose? Nick: I’d choose them both. Andrew: If you had to choose one. Nick: I think it’s more of a college specific thing. Nick: Than a professional thing. That’s because there’s a lot of emotion tied into your alma mater and the memories that you had in college. I think it’s more of a college specific thing than a baseball versus football thing. Andrew: It’s weird, because it’s one of those things where it’s like in baseball you play them 19 times. You can’t really exactly have 19 rivalry games. I will say this. In the NFL there is some. Redskins-Cowboys. Maybe not as of late, but in years prior, back in the day a little bit, that was hatred. Cowboys-Eagles is hatred. To me, it’s just there’s nothing different, I mean, there’s nothing like college football rivalries. You think about it, Nick, we can go back to Quincy Wilson-Ermon Lane. You don’t even have to go back that far. Those were buddies who were good friends playing for rivals. I don’t want to say that they dislike each other, but they were definitely trashing each other, and still do to this day. Nick: I don’t think they were shaking hands after the game. Andrew: That’s what I’m saying. It’s a situation it’s guys you know personally, you grew up with, maybe even played at the same school. It’s crazy. Growing up, the Auburn-Alabama one was one that was very close to me. There was a lot of, I’ll just call it like it is, hatred between the two. Nick, for me, and we’re going to get into this more with Bud Elliott here from SB Nation in a second, covers FSU, does a great job. He’s going to come on and talk about it and get his perspective from the FSU side. For me, Nick, this rivalry is even more intense, even more dislike this week. Importantly, because of what’s on the line for both teams. There’s just so much on the line. Listen, is FSU going to applaud themselves? Is it going to be a great year if they win? No. Again, you beat Florida, it’s a great year in a lot of circumstances. You keep all those streaks alive. Nick: You feel a lot better about yourself. Going to a bowl game, beating Florida. I mean, you can still lose your bowl game and not finish with 500, but at least finish the regular season 500. Andrew: Right. Then Florida, on the other hand, got to. Got to win. I mean, it’s must-win for Florida this weekend. I said it, and Dan Mullen kind of. Listen, Dan Mullen, what he did on Monday, what he said on Monday about the rivalry week and all that good stuff, I love it. It’s definitely not just a game. I did think he downplayed the importance of this game for recruiting, per se. He said he hasn’t seen a lot of it with State and Ole Miss, that kind of stuff. I’m just telling you, Nick, and you know as well as I do, you’ve seen the numbers, whoever wins this game usually finishes better in recruiting. Nick: Yeah. I think he downplayed it maybe just because it’s this week, and he was talking about it in the media. Nick: He wasn’t downplaying it in the spring. Nick: He made a point to say this is a game you don’t lose. Andrew: Right. I thought what he said was crystal clear and something that a lot of coaches will hide away from. He said, “You can have a bad year, and you win this game, and it goes from bad year, but we beat Florida, or it’s a bad year, but we beat FSU.” Let’s just think about it, Nick. In the bad years Florida’s had, heck, in the SEC East Championship run, had they beat Florida State, you’re talking about a completely different thing. You and I and others were saying they made it to the SEC title game, but they lost to Florida State. Nick: Especially the two four-win seasons that Florida had. Nick: You feel so much better if you come away with a win against Florida State. It’s a perception thing. It’s a rivalry, being able to talk smack thing. It’s going out on a winning note. Those two years those were Florida’s last games of the year, and your last game of the year you’re watching a bunch of guys from Florida State parading around your field with a Gator head above them. That’s not a good feeling. Nick: People were like calling it out and saying it was six. I was like, he was only at Florida for four years. Andrew: Right. For me though, Nick, and you may not take this way, and that’s cool, for me that showed me right there the importance they put on it, for him to know that. You ask a lot of football coaches, they couldn’t have told you what they did in those games. That, to me, just shows how important Urban made this game. I know there was the joke was that he didn’t let his team eat in Tallahassee. Well, that’s the stuff that a lot of people take. That’s rivalry football. Andrew: Anyway, let’s go to our man Bud Elliott here. We’ll talk to him, get his perspective on the Noles and the school out West, and then you and I will come back and break this game down a little bit more. We’re back with our man Bud Elliott from SB Nation. First of all, Bud, thanks for coming on. How’s things going? Bud: Going well, man. Going well. How you guys been? Andrew: We’re good. Not losing four games, and guess what, they’re scoring points, so Nick and I aren’t falling asleep in the press box anymore. Bud: That’s kind of different for Gators this year. They look like competent. You know what I mean? I don’t think they’re amazing, but they’re a pretty clear step above from where they were last year. Andrew: We broke some news. The slant pass is now legal in football. Andrew: Tell me about it. Did not know that. Nick and I forever thought the slant pass, and forward passing, by the way, that’s also legal. Bud, let’s go ahead. Nick and I talked about this all week. I wanted to get your take on this. For me, this game is just so much different. Again, both of these teams are whatever. They’re going to go to a bowl game, a meaningless bowl game, if Florida State wins. It’s just so much different for me. Florida’s in a must-win game, in my opinion. I said this to Nick, and I’ll ask you the same thing. Everything’s pretty much forgotten if Willie Taggert wins on Saturday, right? Bud: Yeah. I think so. I’m always interested in the concept of must-win. Must-win or what? What happens if you don’t win? For Florida State, it’s pretty clear. It’s must-win or you’re not going to go to a bowl game, and there’s some people that are disappointed that you’re not going to a bowl game. It’s also you’d like to have those 15 bowl practices, certainly, to prep, and you might like to go play Jimbo Fisher at A&M in the Shreveport Bowl, because it looks like, unless they can beat LSU, that’s probably where they’re going. Bud: You’d like all that stuff. Florida, they’re already in a bowl. You know what I mean? Does it matter that much? I guess for the rivalry purposes. Andrew: For me, Bud, and you know, you’re in this recruiting game as big as I am, for me it’s just if Willie Taggert wins this game, he’s going to walk into a recruit’s living room, and he’s going to say, “My worst team in Tallahassee beat Dan Mullen and Florida. My worst team.” I don’t know. I just feel like all the momentum has been in Tallahassee, and let’s face it, Florida recruiting hasn’t been very good. If you lose this game, how do you recruit against Florida State? How do you recruit against Willie Taggert? Florida should win the game. Florida State’s had a bad year. How do you combat that in a kid’s living room? Bud: That’s a great point, certainly. I would say, I guess, if we’re trying to go point-counterpoint, I would say most of these kids that you’re recruiting, they don’t have a whole lot of overlap in kids this year. Florida’s not really on Tyler Davidson and Will Putnam and those guys. They have some overlap with the two D-tackles, depending on if they’re even still talking to Hunter. Obviously, Quashon, I think Florida wants pretty hard. So, I think it could matter there. Most of these kids, you’ve been cultivating relationship with them for a year now, or close to it. Bud: I do think that fans at times tend to overrate winning and losing, especially in the first few years. I have this idea, and I write about it for SB Nation. I said, look, your first couple years are all about selling hype and vision. Get to Year 3, Year 4, Year 5, at that point you need to sort of show what I call your proof of concept years. All that vision that you’ve been projecting, at some point you actually need to show some kind of results, some kind of positive momentum. 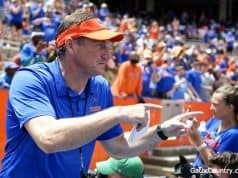 I think Mullen’s already started to show some of that in Gainesville, certainly. They just look a lot more competent than they have. They’re not shooting themselves in the foot as much. It’s Year 1, so some of that is to be expected, but I think early on you’re selling hype in that first two or three classes, regardless. Nick: You can’t have those checks bounce in Year 3. You’re writing checks in the first couple years saying, this is what we’re going to do, and then when it doesn’t happen by Year 3, people start saying, what were you talking about? Bud: Perfect example is Harbaugh. This was the year that he had got to do something on the field, and you’re starting to see the recruit momentum, right? They’re in on that big tackle out of Annapolis. I know we’re kind of getting into the weeds here, unfortunately, but they’re showing results on the field in a year that they absolutely had to, and it’s paying big dividends. If they had had another 8-4 year, where they lose to all their rivals, I don’t think the recruits would be on to them much. Andrew: Maybe I do overthink that a little bit. I definitely think from a standpoint of keeping your fanbase energized. I don’t want to say, the fanbase isn’t fully energized right now, but they’re a lot more energized now than they were last year. If you lose to Florida State, and let’s just say they go to the Outback Bowl, it doesn’t matter if they beat Iowa 75-0. If you lose again to Florida State, the whole talk is going to be when are you going to beat Florida State? Because that’s going to be the game that continues on. For me, Nick and I talked about this in our intro a little bit, a lot of football coaches try to downplay this rivalry thing. I hate the saying, it’s just another game. Bud, you and I both know that’s a lie. This Florida-Florida State game is not just another game. Dan Mullen has made these rivalry games something different. He’s won the LSU and the Tennessee games. Lost the Georgia game. If he can win this Florida State game, fans are going to believe more in what he’s giving. For some reason, I just continue to think that filters into recruiting. Bud: I think it does have an effect in recruiting. There’s no doubt. It definitely matters with your boosters and with your supporters and your ticket sales and all that kind of stuff. In Tallahassee, much like I guess in Florida, they’ve had two really disappointing years in a row, and the home schedule last year was absolutely dreadful. The product was even worse. This year, they’ve had a tougher schedule, but the product has not improved. They’re struggling that way. Andrew: Right. Florida’s trying to counteract that next year. They had a bad home schedule this year. They have a better home schedule next year. They would love for ticket sales to go. Let’s get more into the game here, Bud. Florida State knocks off, upsets Boston College last week. Are things starting to turn the corner for Willie Taggert and his crew? Are guys starting to, I don’t want to say buy in, but starting to understand what he wants, what his coaching staff wants more? Bud: I think so. In some ways they’re finding their mix of what works on offense, as far as who can be playing more of the snaps at the receiver position. They’ve had, I mean, almost certainly the worst offensive line the Power 5 this year. I wrote about it basically in Week 1. When they lost two key pieces go down in Week 1, I was like, they are so screwed. I had guys on that staff tell me, I think we’ll be a pretty good team if we can stay healthy up front. Watching their practices, man, our backups, we have a hard time running practice when those guys are in there. The drop-off is substantial. Week 1 they have two guys go down, and they were screwed, and we knew it. That’s how the season largely played out. They’ve had nine different offensive line combinations up front to start the games, which is crazy, because they’ve only played 11 games. That’s not really by choice. It’s mostly been due to injuries. They had a spot where they were very thin, some of the backups were questionable, and they went down early and often. That kind of wrecked their year in large part. I think it snowballed in some ways. The defense started trying to play hero ball. You guys have seen that in Gainesville before, where they play disciplined for a quarter, and then all of a sudden, it’s like oh my gosh, now the opposing team has 17, and we just know this offense can’t score 20. We can’t give up a field goal. Everybody gets out of position, because they’re trying to make hero plays. I call it hero ball. In the most recent game against Boston College, they started to do a little bit better with their tempo. Francois got rid of the ball a little bit quicker. They found, I think, they really like this receiving core, especially the young guys. Almost all of their best receivers are freshmen and sophomores, and they’re starting to kind of find their rhythm. The defense did a great job stopping the run against Boston College. I think their backs had like 44 carries for like 130, which is terrible as far as an average goes. Andrew: Yeah. That’s something that, to me, is surprising a little bit. Cam Akers is such a special player. You would think that would be better. Keep Francois healthy has definitely been the key. I guess, when you start to look at this game, Bud, are the keys in the trenches? Is that the key for you is who wins in the trenches? Bud: I think that’s certainly going to be a big time thing. I’ll most likely give the advantage to both defensive lines here. I think Florida’s D-line has a bigger advantage over FSU’s offensive line, because you guys will see on Saturday. It’s really bad. You remember Archer Williams, that kid they signed a couple years ago, D-tackle out of the Carolinas? Bud: They’ve had to move him over now, with no experience playing O-line, to be a starting guard. Mike Arnold, who is a kid out of central Florida, I’m sure you guys probably remember from several years back, he’s their other starting guard, because Minshew’s out with a neck thing. It’s a mess. In turn, I think Florida State’s D-line probably has an advantage over Florida’s O-line, but less so, because Florida’s O-line looks pretty good in a lot of games, at least, just from what I’ve been watching this week. The one thing that’s really interesting to me in this, and I’ve been digging into this, these offenses are like polar opposites. Florida State’s offense, their efficiency, their down to down consistency, is terrible. Florida State is 106th in that state, but they’re 18th nationally in explosiveness. Think about the split on that. FSU hits huge plays or nothing. Florida, on the other hand, is 19th in efficiency, down to down consistency. Really good. Excuse me, not 19th, 16th. That’s really nice. Their explosiveness, they’re 96th. It’s like Florida doesn’t hit big plays, but they’re very good down to down. FSU cannot sustain a drive to save its life, but then it hits huge plays. That’s crazy. You usually don’t see splits that large, and for both teams to have splits that large in opposite directions is going to make for an interesting game. If you’re Florida State, you got to dare Florida to hit big plays. If you’re UF, you got to dare FSU to actually sustain a drive, which will be interesting, because Grantham really likes to blitz. Can he be a little bit more conservative in this game? Because I would not blitz FSU. I would play two deep and make FSU drive. Andrew: Nick and I have talked about that, and we talked about that a little bit on our Monday podcast. Florida State’s been a little suspect of allowing some deeper throws. If Florida State makes Feleipe Franks throw the deep throws, I like Florida State’s chances, simply because Feleipe hasn’t shown the ability all year to consistently hit deep throws. He didn’t do it in the Idaho game. Nick: He consistently throws them five yards past his receiver. Andrew: Yeah. The joke on Twitter is they’re going to pump fake and overthrow a receiver. That’s the joke. It sounds bad to say about Feleipe, but that’s what it’s been. It’s not the arm strength. We all know his arm strength. It’s simply the consistency of throwing it deep. Bud: I go back to what Jimbo said in the press conference last year. When he was talking about Florida’s offense, he goes, “Franks can throw it long distances.” I was like, at the time I got to think about it, and I was like, I don’t know if that’s actually a compliment or not. Andrew: We’re not playing, what is it when you throw the little ball in track and field? What’s it called? I don’t even know. Andrew: Yeah, the shotput. I don’t know why I couldn’t think of that. We’re not throwing shotput. Bud: This is fascinating to me, this matchup. If you’re Florida, can you be patient enough on defense? Because I don’t think Florida State can put together sustained drives of 7, 8, 9, 10, 11 plays. If you’re Florida, if Florida State dares you to hit big plays, can you do it? I think that you need to play, both teams need to make the other team play left-handed. Don’t let them play to their strengths. Nick: What have you learned about Deondre Francois this year? You mentioned the offensive line. I didn’t think he was going to make it to this point in the season, after watching a couple of the games early in the year. What have you learned about him? Andrew: Before Bud answers that, I learned he’s not human, or he’s wearing body armor, one of the two. Bud: He’s always been a physically tough guy, right. Willie Taggert preseason called him out on his leadership. Obviously, we know that he skipped the Senior Day game last year. He was snapchatting in Orlando, which was not a good look. Taggert called it High School Harry and all that stuff, which I think was appropriate. He’s physically tough. He doesn’t seem to want to pull the ball and run with it, which was a major change against Boston College. I don’t know if he’s thinking, I’ve made it through the season, I’ll go ahead and run now. He successfully executed the zone read more times against Boston College, and I’m serious here, more times against Boston College correctly than he had in the previous nine games combined. So, that was kind of a marked change. I assume that he will do the same, or at least will attempt to do the same, against Florida. He’s never been a super accurate guy. You guys have seen him in seven on seven back in 2011, 2012. He struggled with that at times. He does like throwing it up to Nyqwan Murray a lot, because they’ve been since like elementary school. He’s improving his sort of rapport with Tamorrion Terry, and that’s been big, because Terry is really good. I mean, he just seems to break free for a bomb in pretty much every game, including the game winner against Louisville, or the one to set up the game winner against Louisville, and then obviously the one over Boston College. He had one against Miami. It seems like he kind of gets loose every week, and eventually Francois finds him. Andrew: Do you think the game overall, Bud, will be won on which team throws the ball better? Is that where this is setting up? If I’m Florida, I’m bringing pressure, and I’m making Deondre Francois stand in the pocket and beat me. If I’m FSU, I’m blitzing Feleipe and making him think a few minutes about it. For me, it’s almost which team is going to be able to throw the ball better in the game. I don’t know that either defense is going to allow the other team to just run on them. Bud: I agree. You actually have to take away the run here. Although, if I’m Florida, if I want to stay in sort of a two-deep look, which I know is really not Grantham’s MO, but if he did want to do that, there have been teams that have stayed two-deep shells on this FSU offense, and Florida State has had mild run success. I think if you’re opposing defense, you’re like, that’s fine. Okay. If we give up 4.0, 4.1 yards a carry, that doesn’t sound good, but if give that up in a two-deep shell, you’re not allowing explosive plays, you’ll take that all day. Florida State is a bad red zone team, because they don’t really have a mobile threat at quarterback, and they can’t block anybody. Other than that, they’re really set up to be in the red zone. That’s the big thing. Teams that have not allowed Florida State to get explosive plays, however you want to do that, that is when Florida State loses, because they cannot sustain drives on offense. It just doesn’t happen. Eventually they’ll either false start, because their tackles know they’re not any good, and they’re trying to get a head start, or you’ll get a holding call or something like that, or they’ll get blown up for a sack or a TFL, and the drive is off schedule, and then they’re cooked. You can’t allow explosive plays. That’s the #1 thing Florida can’t do. Nick: I think last week it was four trips to the red zone, but three field goals. This isn’t a game where when you’re getting down into that area, you don’t want to trade three for seven. Florida’s been a defense all year, when they get their backs up against their own end zone, they kind of hunker down. There was the seven-play goal line stand against Georgia. They just seem to at times be bend but not break. I think you did bring you up an interesting point. Grantham has gone conservative at times this year, and you’ve been wondering where is the pressure? But I think that will interesting, like you said, you can probably get pressure with four. So no need to bring seven. Bud: When you think about the games that Florida lost, they lost to Missouri, and Missouri hit several explosive plays, just from what I remember watching the highlights. Georgia hit a couple explosives. Bud: Yes. Then Kentucky hit a couple explosive runs. I don’t think they had any explosive passes. I mean, when Florida doesn’t allow explosive plays, they’re so good on a down to down basis offensively. It just seems like eventually one squirts out, and then all of a sudden, it’s 80, which is crazy. Andrew: Florida has struggled. In the games they’ve struggled, it’s been because they’ve failed to get pressure. I feel like that shouldn’t be an issue this week, but then, at the same time, it’s one of those things of if they do bring pressure you have to hope that they get there and the defense doesn’t allow one of those big plays, like you’re talking about. Bud: Exactly. I think Florida State loves to get their slot guys matched up on safeties who may not be as good in one on one coverage. Two-star freshman, Keyshawn Helton, by the way, has been really good. That was a kid they took a chance on last February, right before Signing Day and signed him. I was like, I don’t know if you want to take five receivers in this class, but I was wrong, and they were right. He has been really good. He’s actually been taking some starter’s reps. Kid out of the panhandle. They like to get him matched up. Then, of course, Nyqwan Murray, he’s always been pretty enigmatic, but talented. They like him in the slot as well. And DJ Matthews. They’re still dangerous at receiver. They just can’t block anybody. Nick: Hard to be dangerous at receiver when your quarterback is running for his life. It’s early in the week, Bud, but this is the time where we either let you make a prediction for the game, or you can tell us Florida State wins if this happens, Florida wins if this happens, if you don’t want to make an outright prediction, as we tape on Tuesday. Bud: Sure. I’ll make a prediction. I think I’ll take Florida, like 23-20, in a game where nobody really walks away, or I’ll go 26-20. Let’s make it really ugly. Bud: There we go. The old Mississippi State-Auburn score from back in the day. I just have a really hard time picking Florida State when they don’t have the ability to block anybody, and they don’t have any tackles. I mean, they’re playing two guards at tackle, and it shows a lot. They’re playing a defensive tackle at guard, and another kid who they never really thought would start at guard. When Alec Eberle is by far your best lineman, that’s not really a good endorsement of the line. So, yeah, I’ll pick Florida. It won’t shock me if Florida State wins. I don’t think it’s one of the blowout things like Notre Dame or Clemson. Andrew: Yeah. I don’t think so either, Bud. I think it’s a close game, and I think it’s a touchdown game either way. Anyway, tell everybody where they can find you real quick, and we’ll get you out of here. Talk to you soon. Bud: Sure, guys. Check out any kind of Florida State content, if you feel like it, on Tomahawk Nation and also SB Nation recruiting, for all the recruiting stuff. I just updated the Sunshine State scorecard. Right now it looks like Florida is trailing in that, but I think they’ve got a couple nice pieces that will come on board for them. Should be a fun race to the finish in the state of Florida recruiting battles. Andrew: It should be fun, definitely. Bud, we really appreciate it. Looking forward to the rivalry game. Everyone give him a follow, and we’ll talk to you soon. Guys, we’re back. We really appreciate Bud. He might be a Nole, but, Nick, good friend of both of ours, even though his Tampa Bay Rays stink. Go Braves. I get Bud’s point about that whole must-win thing. Maybe, maybe, I’m over prioritizing this game, or whatever you want to say. Maybe I’m overthinking this a little bit. For me though, Nick, it’s just, and maybe I’m listening too much to the fans, maybe so, but for me it’s just one of those games where it’s like if you lose this game, it’s tough. It’s really tough. Now, granted, you go back, and you win next year, it’s all good. Do really want to go 365 days losing to a team who heading into last week was a four-win football team? Andrew: I don’t know, I mean, not that I don’t know. I know for a fact that one game doesn’t tip the scale either way, but this is not one game, Nick. This is six years now, if you lose. This is a situation of two programs that are both first-year coaches that are trying to build something. I always say it. Recruiting is a marathon, and it’s a building block. You don’t build a house in a day. You don’t build a recruiting class in a week. You build it over a period of time. Granted, Florida and Florida State aren’t battling for a ton of guys in the 2019 class, but guess what? By this time next year, half the 2020 class will be in the books for both guys. They’ll be committed. It’s not just a 2019 thing. It’s a 2020 thing. Then it’s a nationwide perspective. It’s Florida can’t beat their rival, this kind of thing. To me, it’s just, and again, I may be overselling it, I just think it’s so key with how bad Willie Taggert has been this year. As bad as they’ve been, it’s a perception that you need to win. Also, it’s a notch in Dan Mullen’s belt if he wins this game, something Muschamp and McElwain didn’t do very often. Nick: Talk about the games that get you fired. Georgia, Tennessee, and Florida State. Andrew: Exactly. Let’s move on a little bit here, Nick. Nick: I wanted to hit one thing real quick with what Bud said. I don’t feel good if Florida State can force Florida to have to take those deep shots. I was talking to my buddy, who played baseball at Florida State, huge Florida State fan. He said, if you look at it, the teams that beat Florida State are really hitting those explosive plays, that Bud was talking about that Florida State makes. I don’t know if that’s the situation you want to put yourself in. Andrew: It’s not a situation. I mean, I say this, and I know somebody is going to say it, and I’m kind of sick of hearing about it, but someone is going to pick on me or say something about me talking about Feleipe. I don’t trust Feleipe Franks throwing the ball across the middle. Again, that’s nothing against Feleipe. He just hasn’t shown me, and he hasn’t shown me his whole career, that if he is forced to make those throws with a little bit of pressure and have to be on time that he can do that. Listen, Florida State’s secondary is beat up a little bit, probably not the best. Definitely not the best. Not what you’re usually expecting out of Florida State, but they’re still FSU ACC players. If you throw the ball a second late, it’s going to be picked. Nick: Feleipe’s misses are high and hard, and that leads to interceptions, like you said. Andrew: Yeah. It’s a situation where I don’t know if either team can overcome a lot of turnovers. Andrew: This is a game that is going to be a fight. It’s a game that, and Bud’s stat about the explosive plays is accurate. Florida had, I think, three drives in the first half that was under 40 seconds, 50 seconds, but all of them were four or five plays. They were just quick drives. You haven’t really seen Florida take a play and go a long distance. You haven’t had the 99-yard Tyrie Cleveland touchdown like you had against LSU. You haven’t had that big long explosive play really. You haven’t really gotten it out of the running game too much. You had the one to Lamical in the Vandy game. I’m trying to think if there’s been a lot. You know what I’m saying, Nick? You haven’t had long explosive plays. This is a Florida team that needs to drive and stay in their own zone, or in their own skin a little bit, play their own solid game. To be fair to Florida, on their defensive side of the ball they haven’t gave up a ton of explosive plays. They’ve been suspect at times, but it’s not like you’re just hitting 80-yard plays all the time against them. Nick: Florida, I’ll go back to 20 yards, 10th in the SEC with 49 plays of 20 yards or more. Ninth in the SEC with 23 plays of 30 yards or more. Then when you get into those homerun plays, 40 yards just 12th, only nine. Don’t have a play over 60 yards. Only four of 50 yards. You’re down there with Kentucky and A&M and Arkansas, dead last when you’re talking about plays of 50 yards or more. The explosives aren’t there. I think it’s just been the goal for Dan Mullen and the offense this year has just been stay out of the sticks. Get to a 3rd and manageable, 3rd and 3, and not take that big shot on 1st down. They’ve done it some. Andrew: That’s what I was going to say. Haven’t really even taken a ton of shots. You had the ball in the Georgia game, and you had a couple in the Idaho game that were taken. Overall, they haven’t taken a ton of deep shots. Nick: They take them, and they were overthrown. Andrew: Still though, think about it. Even the overthrown balls, there hasn’t been that many. Andrew: I think what you said is the reason for that. That is on 1st and 10 can you really take a deep shot and risk the opportunity of being 2nd and 10? Is this an offense that you trust being behind the sticks? I don’t think Dan Mullen does, not consistently. That leads to it. You look at a team that can hit explosive plays is a team that also 2nd and 10 is no big deal. 3rd and 10 is no big deal. Nick: Not ideal, but you’re not freaking out. Andrew: Right. That’s what I’m saying. When I say no big deal, I’m saying they feel like they can execute that. Florida, 3rd and 10, do you feel like they can execute that on a consistent basis? I don’t know about you, but I’m saying no. That’s just my take. I need to get back on point though real quick. In the Kentucky game, Nick, Florida didn’t have a pass rush. In the Georgia game, Florida didn’t have a pass rush. In the Missouri game, Florida didn’t have a pass rush. All three resulted in losses. When Florida is playing well on defense, they’re getting a pass rush. That should happen this week. Nick: Yeah. Like I said when Bud was on, I don’t know if you need to bring six and seven to get that pass rush. I think you can get it with four. Andrew: Yeah. I do too. I continue to go back to the fact that I just feel like if you can bring four or bring five and get there, fine, but if you have to bring six, bring it. Because this is a team that feeds off of that stuff. Nick: It’s going to be an interesting game, to me. I think FSU is getting better. Obviously, they were never going to go to Notre Dame and look good. Notre Dame is one of the best teams in the country. Like Bud said, they’re starting a defensive tackle at offensive guard. They were never going to look good at Notre Dame. 42-13 is bad. I didn’t even pick them, I think, to win at NC State. Clemson, that’s just a really tough stretch, playing the #2 and #3 team in the country. #3 is on the road. Then you got to go up and play at NC State in the middle of that. Nick: I think that’s tough. I think they’re playing better. They looked like a dumpster fire in the first game of the year against Virginia Tech, so I think they’re playing better. I just don’t know if they can make enough plays on offense to score. I think Florida could score 30 points, and I don’t know, if Florida gets to that number, I don’t know that FSU can match that. Andrew: That’s my whole thing. How does Florida State score points? Andrew: Because one way or another Todd Grantham is getting pressure on Deondre Francois. Nick: It could be like against Georgia. Georgia had, what, four touchdowns on 3rd down? Andrew: Yeah. That’s what I’m saying. One way or another, Deondre Francois is going to feel pressure on Saturday. One way or the other. If that means Todd Grantham is bringing 11, he’s bringing it. He knows what it is. He knows the deficiency of Florida State’s offense. The biggest thing for me, Nick, is when he does, you got to make tackles. This can’t be a game where you’re allowing Cam Akers to get five and six yards after contact. You cannot allow that to happen, because those are the plays that turn into a two-yard gain turns into a 15 or 20-yard gain, and then you’re thinking about they’re already in field goal range. Nick: You got to limit those explosives. If you’re me, you’re kind of keying up. If it’s me, I’m keying on that. Keying in on Nyqwan Murray. He’s got 51 catches this year, averaging almost 14 yards per catch. Andrew: Right. Again, the little things are what wins rivalry games. You and I talk about it all the time. It’s unpredictable. The only thing you can predict in this game is that you have to go out and play fundamentally good ball. You cannot go out there and have a bunch of stupid penalties. You can’t have three late hits in this game and give up a ton of yardage, because, like you said, how does Florida State score points? Easy. Florida gives it to them. If Florida doesn’t give it to them, I like Florida’s chances. Nick: Not going to win this game if you’re turning the ball over, making mistakes. You got to play a sound football game. I said it last year, and I said it probably in 2013 as well, when Florida was the team that was coming into this game limping. You kind of throw away a lot of the records and what has happened up to this point in a rivalry game like this. Andrew: Right. Exactly. Any other final thoughts, Nick, on our Wednesday? We’ll be on here on Friday. We’ll get predictions and all that good jazz going. For me, that’s kind of it for right now. Nick: Just everyone listening enjoy Thanksgiving. Hopefully with your families. Give them a hug. Let them know you love them. Just enjoy your time off. Enjoy the company that you’re with. Andrew: Get ready for this game. Throw the records out. I think this is going to be a fun football game on Saturday. I’m looking forward to it. You guys will listen to this on Wednesday. Florida plays Oklahoma down, where is that? Andrew: Yeah. Bahamas. That’s right. They play that. It’s an early tip, a noon tip, Eastern time. Check that out. We’ll be back on Friday. Guys, we appreciate it. Nick, tell them where they can find us, and we’ll get out of here. 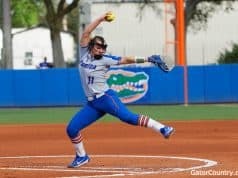 Nick: www.GatorCountry.com for all your Florida Gator news. The podcast is there in audio and transcript form. You can find the podcast wherever you decide to listen to podcasts. Just search Gator Country. Subscribe, never miss an episode. Do your social media thing. @GatorCountry on Facebook and Twitter. @TheGatorCountry on Instagram. I’m @NickdelaTorreGC. He’s @AndrewSpiveyGC. Andrew: There you go. Guys, we appreciate it. As always, go Braves.